Welcome to indonesia furniture manufacturers company website, we are Cv. 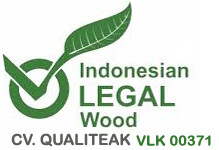 Qualiteak…one of many indonesia furniture manufacturers factory based in jepara city central java indonesia. Our company founded in year 2011 as the second company of the owner which has been working on teak outdoor furniture production since early 2000’s in Indonesia, so we do have a lot of experiences of producing and sending out containers of various furniture style to worldwide market. We working on both indoor and outdoor furniture with classic and also modern design. but our specialty is to manufacture special custom design furniture development that fullfilled the customers demand of presenting fresh new furniture design to their customers. this is beneficial for small furniture store or a one time project that doesn’t have large quantity orders. Our indonesian furniture factory only using legal wood to manufacture our products, they could be come from government plantation forest and also people wood which both has legal certificates. We support our government policy to reduce massive deforestation due to illegal logging. which is massively happens in indonesia. we believe that we do are part of the problem, so we take the responsibility by ensuring forest replantation and illegal logging prevented by our government policy. We get our raw material from both government forest and also people wood in purpose of giving our customer a different range of prices to match their market. Government forest are wood plantation forest run and managed by indonesian State owned enterprise called PERUM PERHUTANI, so they are basically government property. while peoples wood are own and managed by regular citizen in their own land but also under government watch and certification. Our most common indoor furniture that we working on are antique reproduction style. We work on antique reproduction furniture from various style including victorian, italian, french style and more specific original antique furniture. With a support from other indonesia furniture manufacturers and also local jepara city woodworking industry, we able to produce almost all antique furniture style requested from our buyers. We use mostly mahogany wood to produce antique reproduction furniture, all of the wood materials are properly kiln dried and treated with anti wood worm solutions to get best durability and performance during use. Another indoor products we produce are modern design furniture design. Mainly we using teak wood produce this furniture style. Beside the new forest wood, we also work on reclaimed teak wood material to complete the demand from some customers which has this request from the end user. reclaimed wood are gathered from old houses or building from java and major indonesian island. We kiln dried our material to get best result and minimizing problems of cracking and bending. most of the problem caused by different weather in our customer’s countries, which mostly have four seasons and also extreme weather change during summer and winter. Find our outdoor furniture collections in our dedicated website indonesia teak furniture company. Our business goal is customer’s satisfaction of our quality and service. Customers not only doing business with our company employee but also personally serve by the owner and our marketing staff which will giving answer 24 hours a day. Our intention is to build a good and continual relationship, and we know that to build a good relationship will need consequence of keeping commitment to have trust, and we confidently taking that consequence.